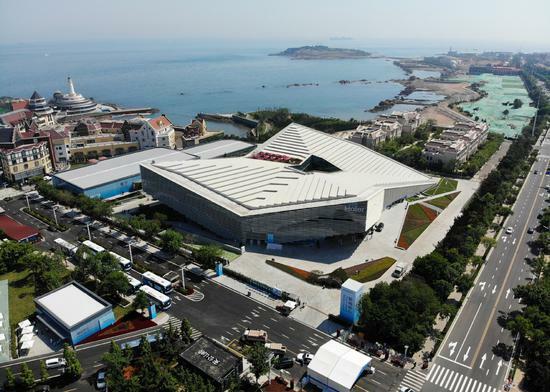 Qingdao is gearing up and sprucing up in every possible way as the coastal city in Shandong province gets ready to welcome visitors from afar at this weekend's 18th Shanghai Cooperation Organization Summit. According to the summit's organizing committee, more than 2,000 volunteers, mostly college students, will be on hand to help at the event. And the welcoming mood has also spread among the general public, with a music video entitled Qingdao going viral on local residents' social media accounts. Major landmarks in the city are in the video, including German-style architecture from the late 19th and early 20th centuries, seaside resorts and the city's new film studios, where a number of Hollywood blockbusters have been shot. Of course, beer and seafood, which are synonymous with Qingdao, are not absent from the video. All of the musicians involved in the production of the video are local residents. "Red tiles, green trees and azure seas are permanent symbols of this city," said Jiang Shikui, the composer and lyricist of the video's song. "The scenes will remind Qingdao people of their childhood. And the SCO Summit will bring global attention here," he said. "We sincerely welcome friends from all over the world to enjoy the scenes, the sea breeze, and our delicacies together with us in a place that combines historical and modern beauty." The city's coastline will be lit up. A large-scale light show will take place during the summit, using skyscrapers as its backdrop, in addition to a firework display. The local community will also benefit from the legacy of the summit. Zhang Jiangting, Party secretary of Qingdao, said that preparations for the summit had been accompanied by improvements to the city's infrastructure. "The city has become brighter, cleaner and greener," with upgrades to Qingdao's power and water supply networks. He added that the summit preparations have used existing infrastructure. For example, part of the venue for the sailing events at the 2008 Beijing Olympics was to become the summit conference hall. Recycled materials were used as decorations to make the summit hall ecologically friendly and leave the meeting space flexible for other usage in the future. Qingdao is embracing the cooperative framework of the SCO not only by hosting a successful summit, but through its own longterm development. According to the city government, the volume of exports and imports between Qingdao and SCO member countries reached 39 billion yuan ($6.1 billion) in 2017, accounting for 6.4 percent of the city's total foreign trade. "The summit may only be for a short time, but its influence on the city will be lasting, comprehensive, and thorough," said Cui Dezhi, director of the tourism development committee of Qingdao. He said that the summit will help the city gain greater global recognition as a tourism destination. In 2017, the city received 88 million visitors, an increase of 91 percent year-on-year.